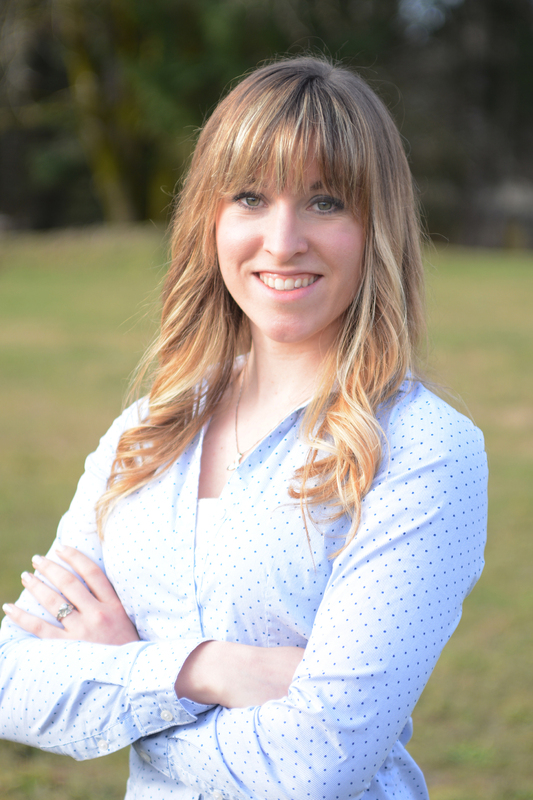 There are several foundational concepts behind the Trim Healthy Mama plan that are designed to improve health and help with weight management. As I mentioned in my intro post, for the most part these concepts line up with research and make practical sense. There are some aspects of the plan that don’t, and I’ll explain some of them below. Here’s your chance to get the overview of what research has to say about the basics of the Trim Healthy Mama Plan. Age-old and still good, the advice to eat in moderation is always relevant. By including protein at each meal and limiting carbohydrate portions, the Trim Healthy Mama Plan does a great job of preventing carbohydrate overeating. Overeating carbohydrates leads to storage of extra blood sugar as fat and can also increase inflammation, so regulating blood sugar by moderating carbohydrate intake can be key to weight loss or maintenance. The weakness I see in this area is with fat moderation. The authors do repeatedly mention the importance of not abusing fat intake, but there is no official limit on fat intake for S meals. This might make it tricky for some to keep fat intake in check (my fat intake was quite high during my first week). Since fat is very calorie dense, it’s possible this could interfere with weight loss or weight maintenance goals. 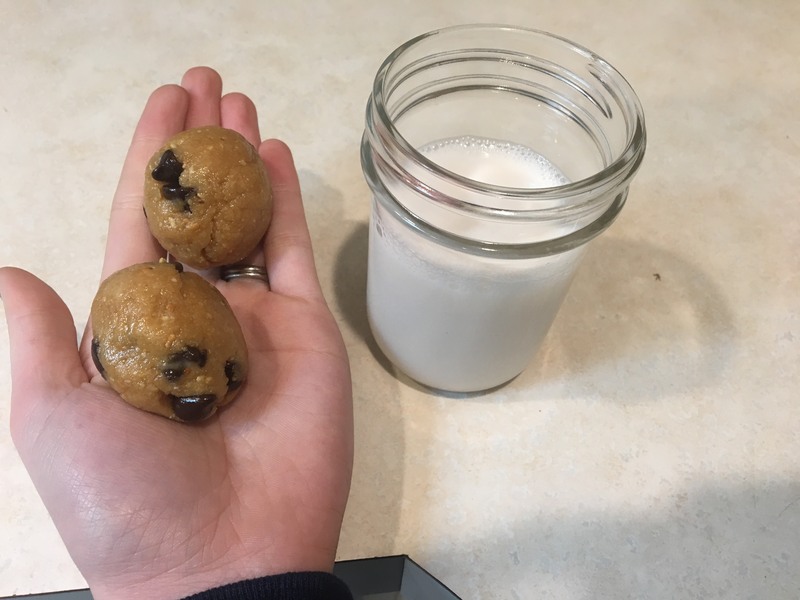 Fortunately fat is filling, so that does help promote natural moderation of fat intake, but keep in mind that the desires of our tastebuds can easily override that moderation if we aren’t careful. Fat is awfully tasty! 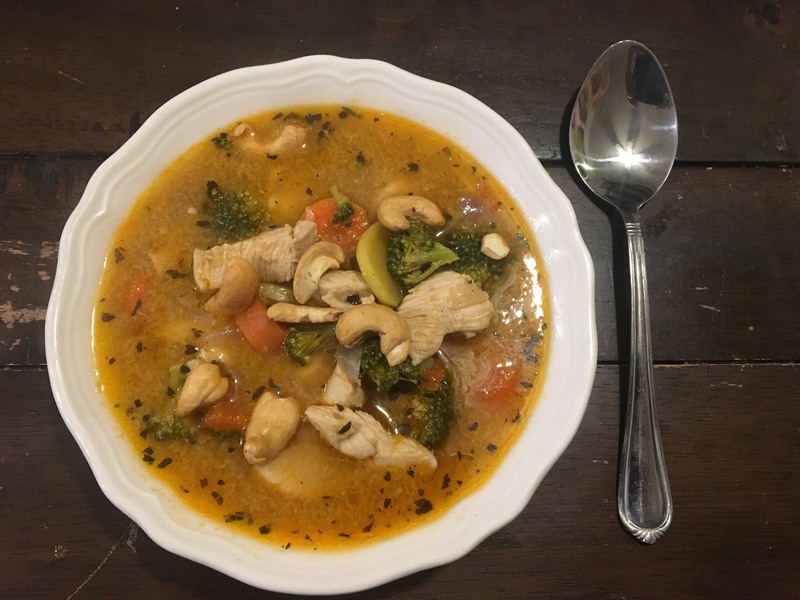 Besides limiting portions of carbohydrates, the Trim Healthy Mama Plan is designed to manage blood sugar (and thus weight and inflammation) by limiting carbohydrate options to those that raise blood sugar more slowly and gradually. This is quantified using a tool called the glycemic index. Foods with a low glycemic index raise blood sugar slowly, while foods with a high glycemic index raise blood sugar rapidly. For example, barley (allowed on the THM plan) has a glycemic index of 25, while white rice (not allowed on the THM plan) has a glycemic index of 72.1 This is generally a good way to choose healthful carbohydrates and as a bonus, it typically increases fiber intake since high-fiber carbohydrates tend to have lower glycemic indices. Researchers have since taken this concept a step further to include not only how rapidly a food raises blood sugar, but also the actual amount of carbohydrates in a standard portion of the food.2 This helps differentiate between foods that contain only a few carbohydrates (like watermelon, which has a high glycemic index but contains so few carbohydrates that it barely affects blood sugar), and those that have more carbohydrates and send them in quickly (like sweet potatoes). This new measure is called glycemic load, and it is a more complete representation of how a food actually affects blood sugar.1 A glycemic load of less than 10 is considered low and a glycemic load of greater than 20 is considered high. Taking glycemic load into account places some not-on-plan foods like whole wheat bread (which has a glycemic load of 9) and whole wheat tortillas (glycemic load = 8) into a much more favorable position as blood sugar regulators. They fall well below some on-plan foods like sweet potatoes (glycemic load = 22). Utilizing glycemic load rather than glycemic index would allow quite a few more foods and make the THM plan less restrictive while better honoring the spirit of managing and regulating blood sugar. My personal philosophy is always to help clients find the plan that is the least restrictive way to achieve their goals – it makes food more fun! The authors of THM also encourage that for weight loss or maintenance, you should focus on only one fuel (fat or carbohydrate) per meal. The reason for this is that our bodies prioritize the use of carbohydrate fuels over fat fuels, and will burn blood sugar before using fat. The authors state that by restricting fuels to one at a time, you can ensure that all fuels (including fats) are fully burned before eating the next meal. This is true as long as the total amount of fuel eaten still matches one’s energy needs in that window. For (an overly simplified) example, if someone ate a meal that contained 450 calories for lunch, and they used 500 calories before they ate again at dinner time, they will have burned all of the 450 calories they ate at lunch (first the energy from carbohydrates, then from fat) and tap into their fat stores to make up the last 50. On the other hand, if they ate a 700-calorie lunch and then only needed 500 calories, they would burn through those 500 (first from carbohydrates, then fat if carbohydrates ran low) then end up storing the extra 200 as body fat. Like I said, this is overly simplified for explanation’s sake and there’s a lot of physiology missing here, but it gives you a rough idea. To bring this back to the THM concept, restricting fuels to either carbohydrate or fat is one practical way to moderate intakes overall, though it certainly is not the only way and it also doesn’t guarantee that the total amount of energy eaten would match energy needs. The key is whether or not the structure of THM makes it easier for you personally to moderate. For some personalities, the structure of S and E meals makes moderation much more clear and easy to follow. If you prefer or it makes more sense to you, you can balance fuels at each meal with moderated portions of carbohydrates, proteins, and fat as long as the total amount of energy you eat matches the total amount of energy you need (or a little less if you’re trying to lose weight). Overall, Trim Healthy Mama provides a structure for moderation that is mostly based on valid concepts and is likely to generate weight loss (if desired). It will also direct your eating to healthier pastures, as it eliminates quite a bit of junk food, empty calories, and inflammatory foods. Basically, if this plan works for your personality and lifestyle, go for it! It is more restrictive than is necessary for health and weight management, but keep in mind that your lifestyle is your own – so you can choose parts of the plan that work for you and parts that don’t! In fact, many of the blog articles I have read about THM say that their writers follow “a version of ” THM. Good for them! They made it their own, and finding a plan that works for your life is just as important as finding one that works for your body. Breakfast time! 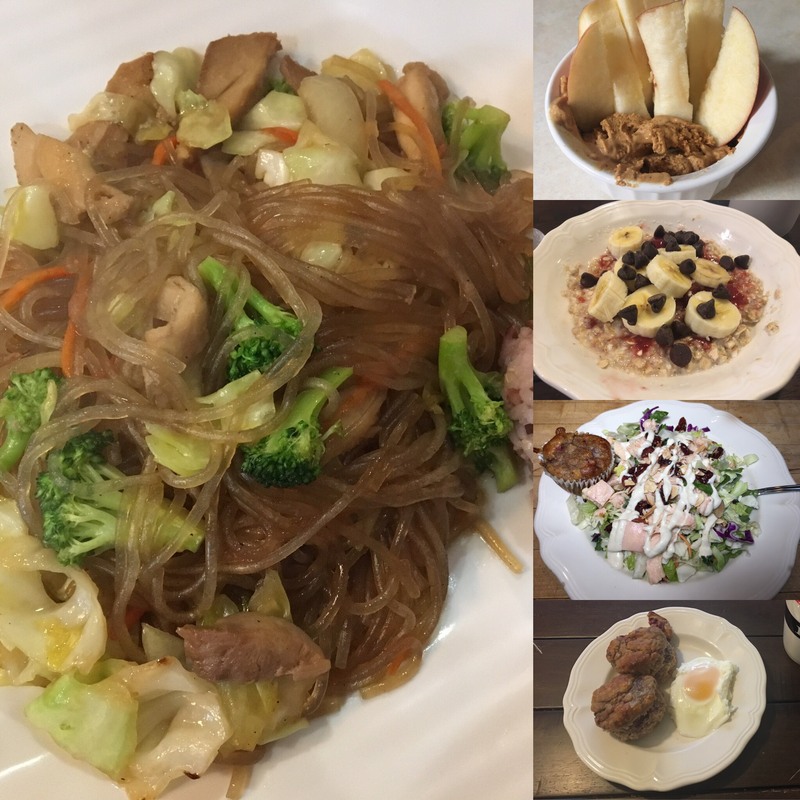 It was trickier than I expected to come up with a meal, mostly because I do my grocery shopping on Mondays and hadn’t bought food specifically for the plan yet. 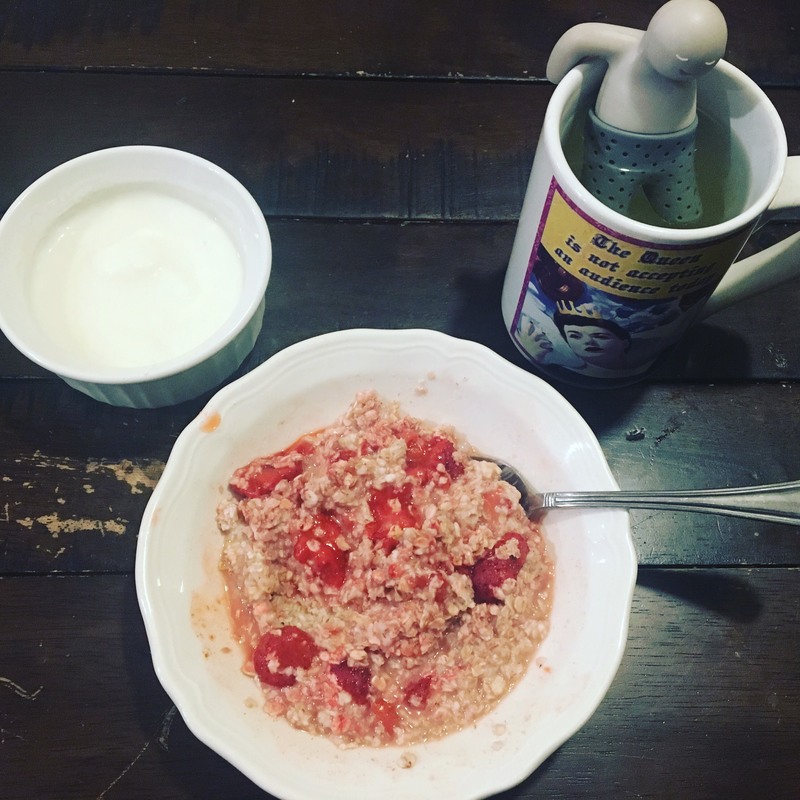 I started with an E meal of oatmeal with strawberries, cinnamon, and stevia. On the side, I had some plain fat free Greek yogurt with a drop of vanilla and some stevia. I was concerned that this meal wouldn’t have enough protein to make it all the way to lunch, but I was pleasantly surprised that I didn’t get hungry until 11 am. I tossed some oranges in my bag for a snack but never did eat them. Dad went in for his surgery and our stomachs were starting to rumble. I volunteered to drop off dad’s prescriptions and grab us some lunch to bring back. Most of the portable options in the vicinity of dad’s pharmacy were fast food. 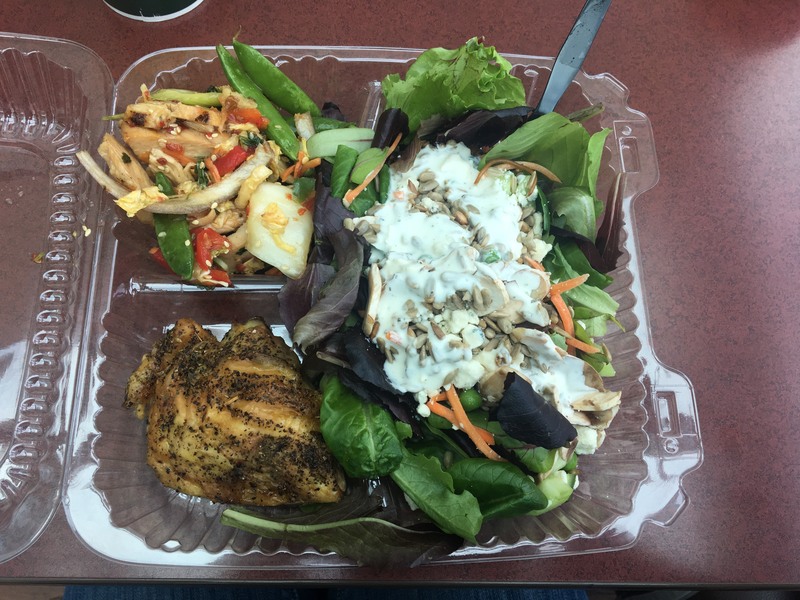 I remembered reading the chapter in the Trim Healthy Mama Plan about eating out. The authors say S meals are the easiest to do while eating out because of the low-carb options at many restaurants. 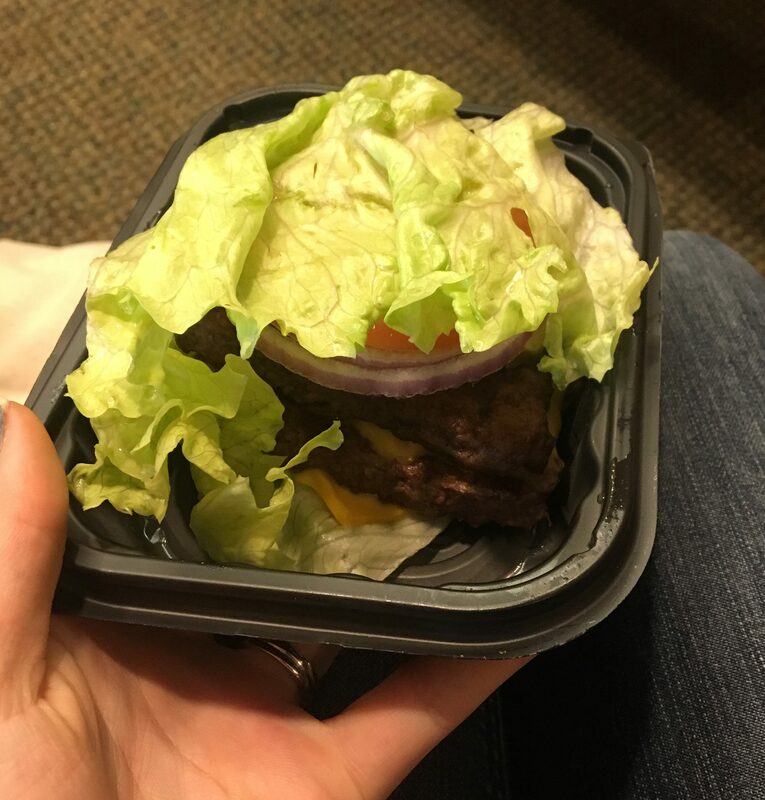 After some quick Googling for ideas on low-carb fast fooding, I discovered that Wendy’s has a lettuce-wrapped burger option, so I dropped off the prescriptions and headed over there. When I was ordering, I was a little unsure how much food I would need to be satisfied. Generally, if I get fast food I order a kids’ meal or a cheeseburger with a small serving of french fries. French fries are a no-go on the Trim Healthy Mama plan because they are high in both fat and carbohydrates (not to mention that they are made of white potatoes, which are also discouraged). I’m a sucker for a salty carbohydrate so honestly that was a bit of a bummer. I planned to order a lettuce-wrapped cheeseburger but then wondered if that would be enough when I’m used to also having a bun and some french fries too. I decided to embrace the concept of an S meal and got a double cheeseburger. Now, as a dietitian, I would consider this meal too high in saturated fat and too high in calories (not to mention sodium), but it fits the THM concept. I thought about ordering a side salad also but their online reviews were less than enticing. The lettuce-wrapped cheeseburger was messy but delicious. I would order one any time! 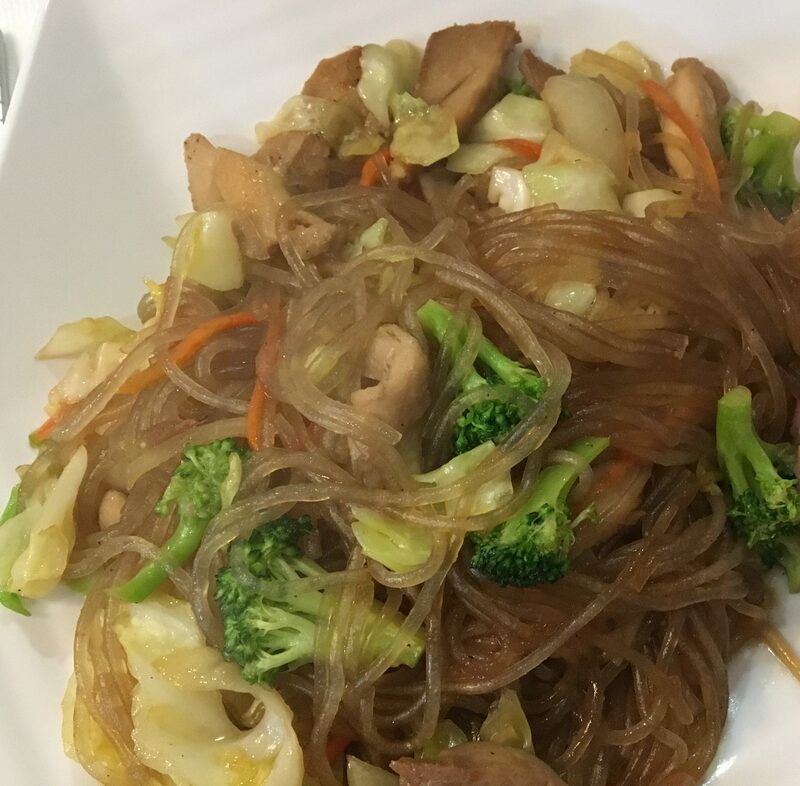 I noticed that eating a low-carb meal didn’t satisfy me as quickly as a balanced meal with carbohydrates does, but after 10-15 minutes the meal’s fat kicked in and I was satisfied for hours. Time for grocery shopping! For the most part, I was able to buy the usual foods my family eats when planning for THM this week. 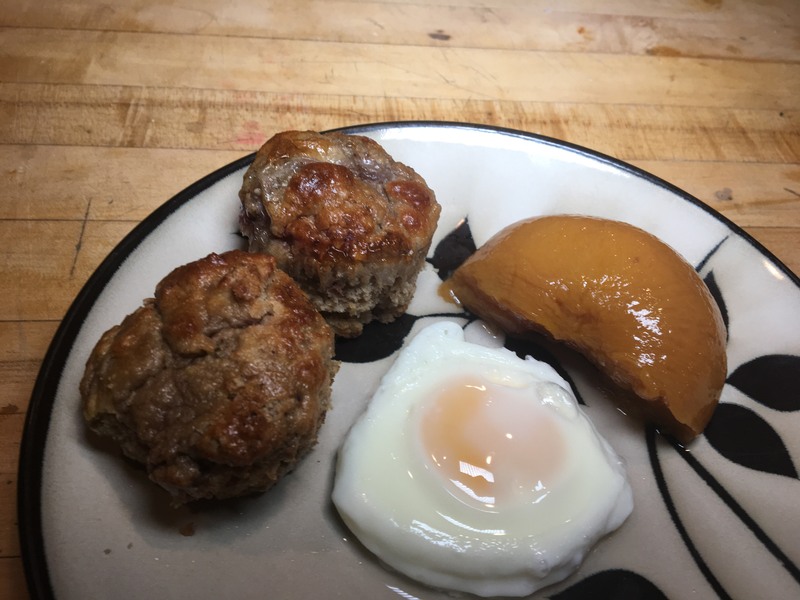 The exceptions included a handful of specialty foods that are recommended to make the diet easier and more interesting to follow. I bought pressed peanut flour (a low-fat alternative to peanut butter, used mostly as a protein source in E meals), almond flour (for grain-free baking), and coconut oil (recommended by the plan for cooking, along with butter). These products were more expensive than the alternatives I typically buy and upped my grocery bill for the week by about $25. The containers I bought will most likely last for the next 3 weeks and probably beyond, so I imagine the extra costs will average out. After running around a bit and making sure dad was settled at home, I ended up making a recipe I had planned for last week but never got around to cooking (and just so happened to be a type of burger…déjà vu, anyone?). 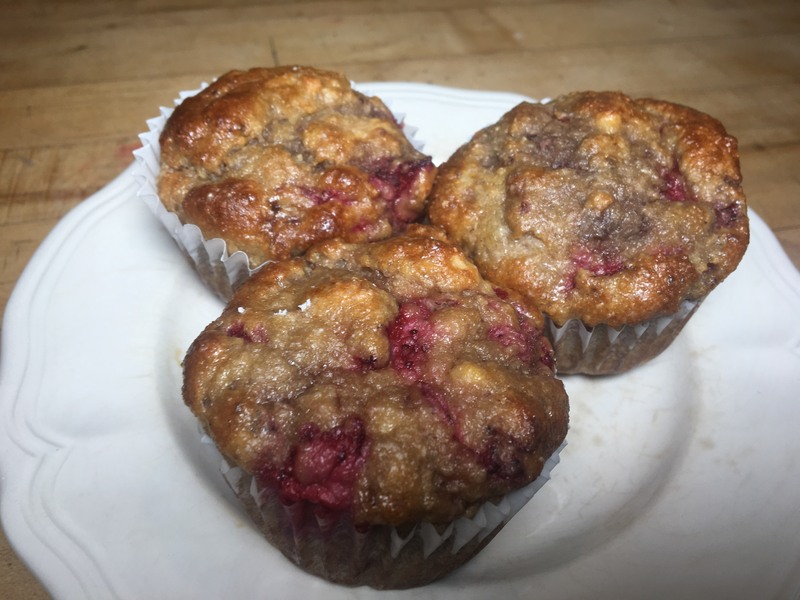 I was able to use up the ingredients with just a few tweaks for THM. 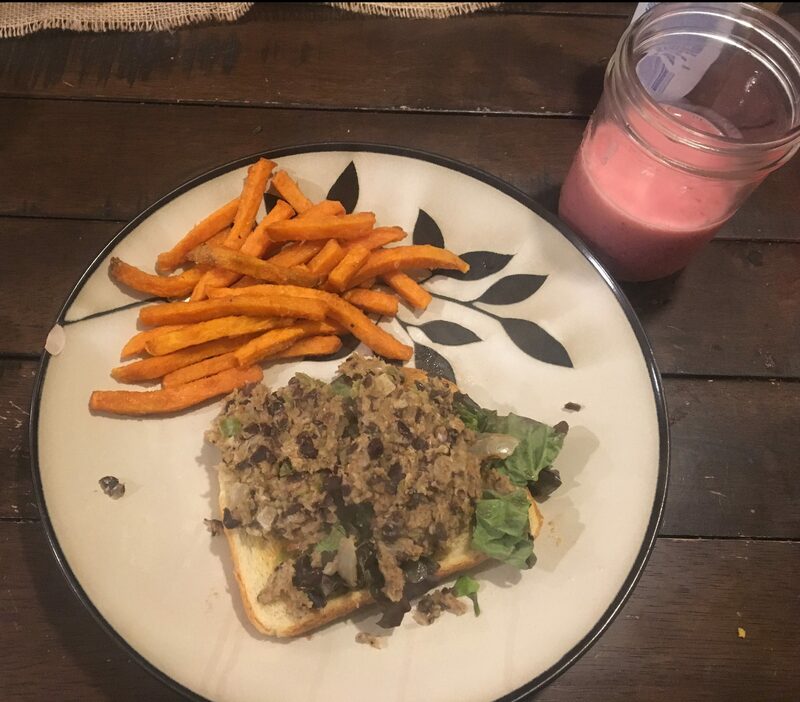 I put my black bean veggie burger (which didn’t hold together well but tasted good) on a bed of lettuce and a slice of sourdough. I made baked sweet potato fries and a strawberry banana smoothie as sides. It was very satisfying and lasted all the way until bedtime! Overall, definitely not a bad day. It’s taking a bit of getting used to, thinking carefully about all of the parts of my meal to make sure to balance fuel sources per the THM plan. I have a feeling my husband and boys will particularly love the S meals I have planned for the week! It is basically structured moderation. It would probably work well for someone who needs a bit of structure (“guardrails” if you will) to feel comfortable with portion control or balance. 80% (or so) of the plan is evidence-based and in line with physiology – I’ll go into more detail about that in my research post(s) next week. The plan is geared directly toward regulating blood sugar, which prevents fat storage, both of which reduce inflammation, which helps regulate blood sugar, which prevents fat storage…you get the idea. This plan directly addresses the most common “vicious cycle” I see in my clients. It is customizable to fit many health-related goals, as discussed in this post. It does not entirely eliminate any food groups. The authors take a very realistic stance and are careful to emphasize that weight loss will be gradual and health is a long-term journey. The tagline on the book is “Keep it simple, keep it sane,” yet even the summarized version of the book is 300 pages long. To get started, you’d probably only need to read the first third of it, but there’s a pretty steep learning curve depending on your starting level of nutrition knowledge. I think (and the authors second) that after a while it would become second nature and not require much thought, but “simple” is not the word I would use to describe the plan out of the gate. As you might have deduced from the second bullet above, about 20% of the plan is not evidence-based or wholeheartedly holds on to questionable or controversial stances. Again, more detail is forthcoming in my research post(s). Labeling foods as “bad” or “good” is problematic and can really affect people’s relationships with food in a negative way. This can get really tricky when you’re trying to discuss the nutritional merits of foods and I run into that too. The authors of the book do say that they believe all foods are good to eat; however, some of their language in the book gives the wrong impression (for example, I’m looking at you “Not-so-naughty Noodles recipe! Noodles aren’t “naughty!”). The authors claim you can follow this plan very simply, even if you don’t know how to cook. 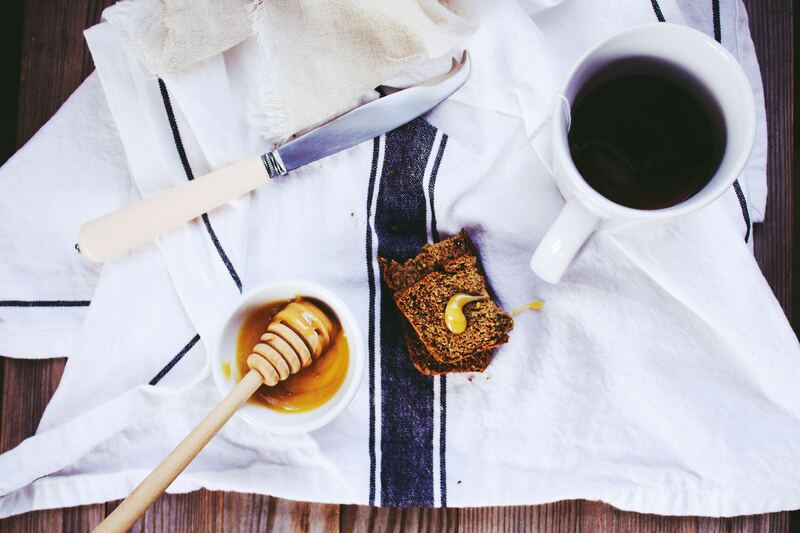 Most of the baked goods are grain free, and I haven’t met too many delicious grain-free baked goods in my day. They claim the recipes are tasty, and I hope they’re right! 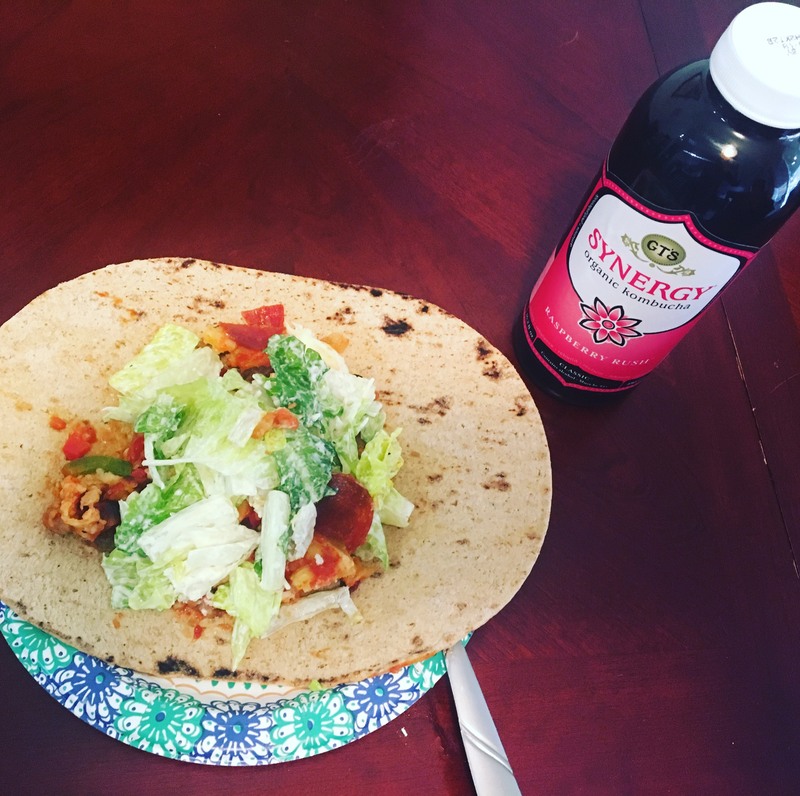 I plan to do a mix of S meals, E meals, and crossovers to get the full experience (check out my Trim Healthy 101 post if that sentence made no sense to you). I sometimes have mild to moderate hypoglycemia which may make it difficult for me to eat S meals, but I’m going to try it to see what happens. The authors state that people with severe hypoglycemia may need to eat crossovers instead to avoid low blood sugar. I’m looking forward to getting started with this one! Let me know your thoughts, comments, or questions and I’ll make sure to address them. If you’re anything like me, the phrase “Trim Healthy Mama” (aka THM) didn’t really mean much to you – maybe you’d never even heard of it – up until this point. I was vaguely aware of the existence of the plan because several ladies at my church follow it, but as far as details, I couldn’t tell ya much. Or anything, actually. 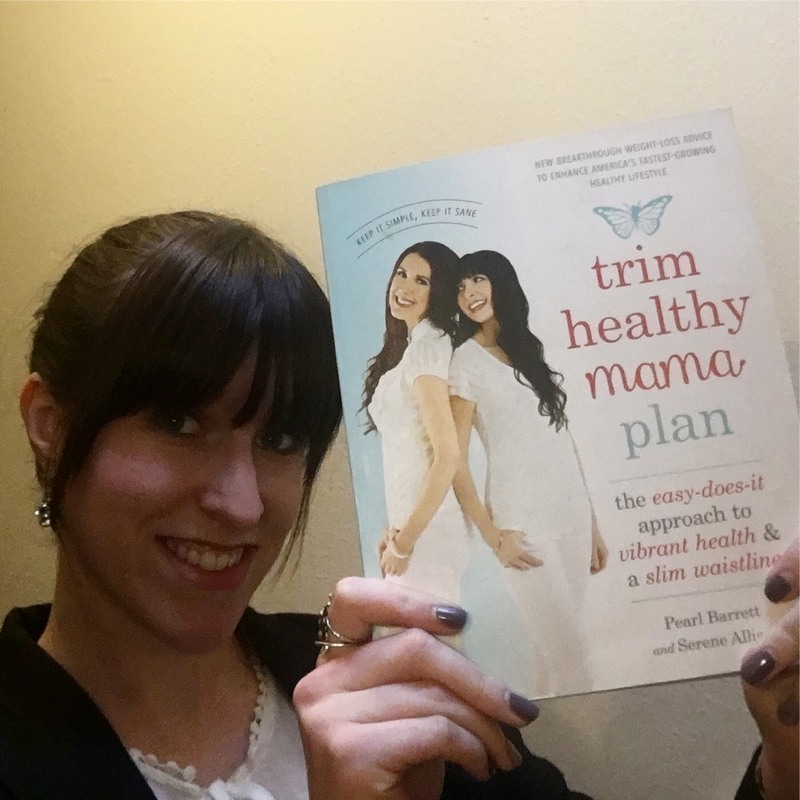 So last week I got a hold of a copy of the Trim Healthy Mama Plan . This book is the 300ish-page summarized version of the 650ish-page original book Trim Healthy Mama . 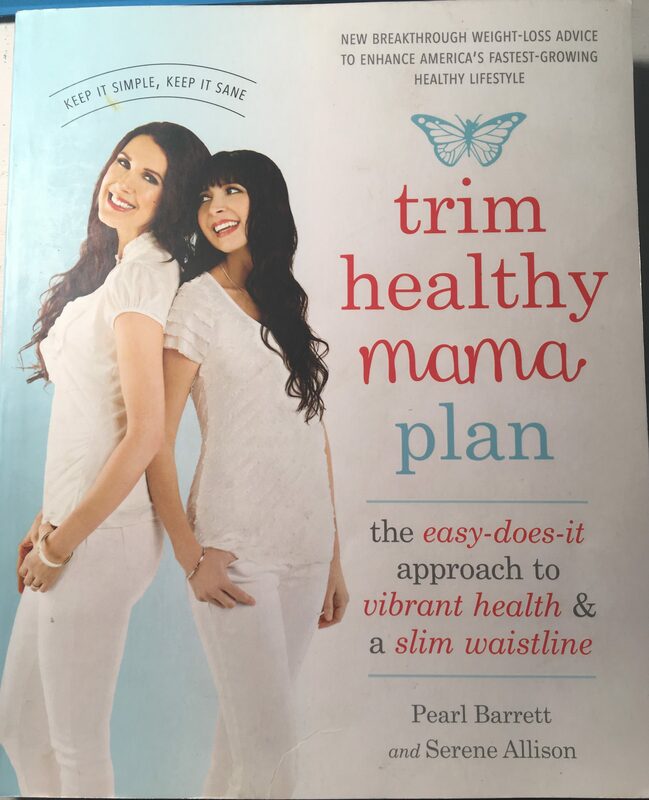 The writers, sisters Pearl Barrett and Serene Allison, have also released two cookbooks: Trim Healthy Mama Cookbook and Trim Healthy Table . I’ve read most of the way through the book so far, and I’ve gotten the gist of the plan. THM is clearly geared toward women but the authors say their husbands love it and have also lost or maintained weight on the plan. In this post, I’ll lay out a very broad overview. I’ll share my thoughts about it and what the research has to say in future posts. The meals and their organization are based on the premise of selecting fuels intentionally based on your goals. According to the authors, eating multiple fuels at a time is more conducive to weight gain/maintenance, while limiting fuels to one type or the other at a time is more conducive to weight loss. Stay tuned for how this lines up with physiology and research! There are quite a few nuances and specifics about the foods that comprise each type of meal which I haven’t mentioned here, since this is a broad summary. 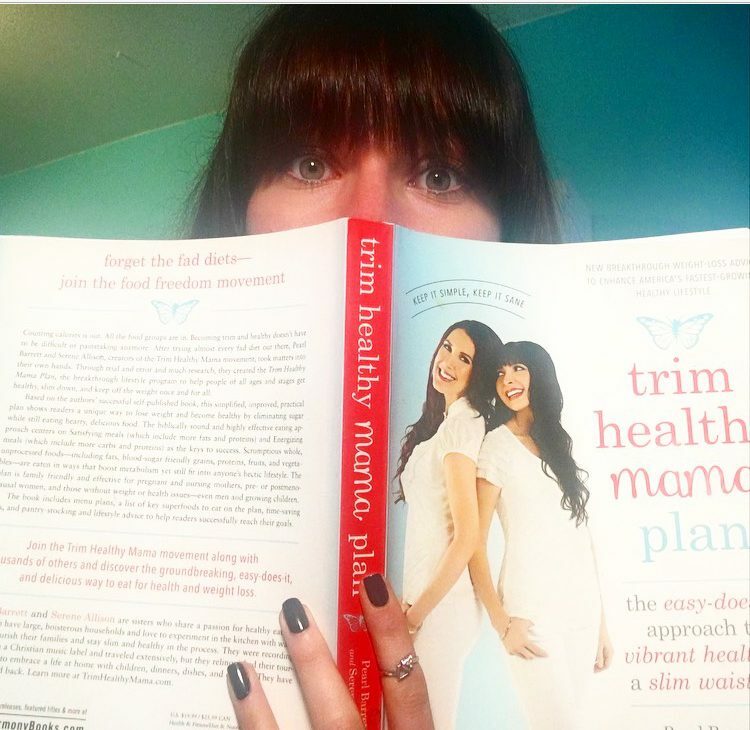 I start following Trim Healthy Mama on Monday, so keep an eye out for posts with more detail and what it’s like for me while following the plan. Let me know what you think or if you have specific questions in the comments! Stay tuned for more information on what Trim Healthy Mama is, how to follow it, what the research has to say about it, and more!